At one point, a chaplain came in to pray with me, as my life was hanging by a thread. Driving home from our summer vacation in July, 2017, I started to feel lousy. My throat hurt, my head hurt and I knew I was coming down with something. I saw my primary care physician who prescribed antibiotics over the next few weeks but my condition worsened. On a Friday afternoon, later that month, I began to retain water, my stomach began to distend and my urine output was very low. At that point, I went to the emergency room. I was admitted into a local community hospital and underwent testing. I was eventually diagnosed with Myocarditis. However, the hospital did not have enough means to support my condition and I continued to deteriorate…quickly. At one point, a chaplain came in to pray with me, as my life was hanging by a thread. My family members requested that I be transferred to a facility in the Chicagoland area better equipped to manage my care. I was granted the transfer and the University of Chicago Medicine Hospital agreed to take on my care. I was immediately transferred to their world-renown Advanced Heart Failure & Cardiac Transplant division. At U of C Medicine, I was put on an Extracorporeal Membrane Oxygenation, or ECMO machine. The machine pumps and oxygenates a patient’s blood outside of the body, allowing the heart and lungs time to rest and recover while they are being administered life-saving medications. During the surgery to install the ECMO machine, the doctors took a biopsy of my heart and changed my diagnosis to Giant Cell Myocarditis. I was fighting for my life and was told that there was a good chance that I would need a heart transplant to live. It was a very, very surreal time for me. Up until then, I had been a very healthy 52-year-old mother of 3, and now I was told I might need a new heart and could be facing a lengthy hospital stay. During the week I was on the ECMO device, and by the grace of God, my heart started to pump on its own. My doctors told me that my heart had recovered enough to remove me from the ECMO device, which occurred surgically a few days later. Thereafter, the drip medications were reduced or eliminated. The lines and drainage tubes were eventually removed. I was finally cleared to leave the hospital after a month of being in the intensive care unit. I was incredibly weak, scared and in a state of bewilderment that this had happened to me. Even today as I write an account of my journey, it almost feels like this happened to someone else and I am watching a movie about it. Four months post-release, according to the doctors, I am making a miraculous recovery with my own heart, and I never miss a day to thank God and my medical team for where I am at. 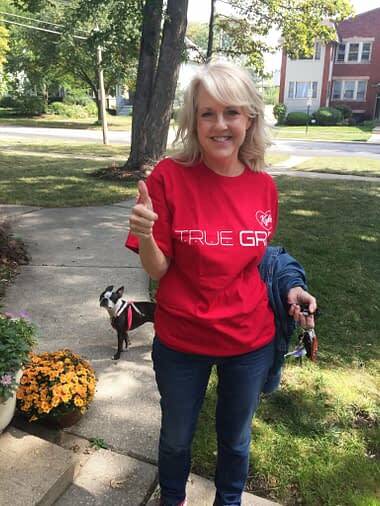 Within a few months of being home, I even walked a 5K with my friends and family, all wearing Kyle “True-Grit” bright red t-shirts in honor of my recovery. It was quite an accomplishment considering I couldn’t hold a hair dryer when I was first released. My recovery has been steady, but the journey is long and continuous. I worry about every irregular heartbeat and any unusual sensation in my chest. Not a moment goes by that I’m not aware that I have Giant Cell Myocarditis. I remain on the heart transplant list in case my condition takes a turn for the worse. I take numerous medications to support and strengthen my heart. They make me jittery, weak and fatigued. I also have steroid-induced diabetes. I follow the doctor’s plan and I try not to complain too much about this new lifestyle. I am enrolled in a cardiac rehabilitation program. I have since returned to work on a limited basis and I am beginning to feel like I am leading a mostly “normal” life again. The doctors say that my heart will never fully regain its former strength and functionality but I am working hard to get back to as close as possible. All of these side effects are minor. I have no complaints…I feel blessed to be alive. I hope my story brings hope to those who read it. And for those who have lost a loved one to myocarditis, my heart breaks for you. I am truly saddened by each and every loss. It’s a terrible disease and the common thread in each story seems to be a lack of a timely diagnosis. I went untreated and undiagnosed for almost three weeks. It appears that raising awareness about myocarditis is paramount to helping more people survive. I hope to do my part in this fight and to help save the precious lives of those who might suffer.